The base card design is indiscernable from year's past and could use a revamping. The best part about the card design are the themes used to incorporate relics, you'd be hard pressed to find a product with more interesting themes than Triple Threads. For instance, one of the cards I pulled was a Peyton Manning triple relic auto that spelled out "4x MVP" using jersey pieces. By far the products best and rarest cards are the set's book cards, which feature some of the craziest patches every embedded into a piece of cardboard as well as multiple autographs and relics that can feature up to six players at once. The checklist is a seamless combination of rookies, legends and current day stars. From Vince Lombardi to Walter Payton, Triple Threads offers collectors one of the best legends checklist in the business. The rookie checklist is decent, but it's ultimately not the product's emphasis. You'll find the upper 25-35 percentile of 2010 rookies including Bradford, Tebow, Bryant, Suh and so on, but you won't find any of the lesser names on the rookie checklist. Like most high end products, Triple Threads is a boom or bust proposition. You could end up pulling the card of a lifetime like an insane foldout book card featuring patches and autos from Joe Montana, Dan Marino, John Elway, Steve Young, Troy Aikman and Joe Namath (sold for $2,011 on eBay recently) or end up on the opposite end of the spectrum. Compared to many other high end products, Triple Threads has an above average value due to the fact that you get two packs rather than the high-end standard of one. Triple Threads also has a niche following which helps boost the resale value of the product's cards across the board. Triple Threads is a fun product that grows on you. The coolest part about Triple Threads are the card themes, which are smart, well done and can turn what would otherwise be a weak relic into an interesting card. I also like Triple Threads' two pack format, which makes for a more exciting and longer lasting box break than your typical one and done high end box. Overall, it was an enjoyable product that has some really cool cards hidden within it's packs. 2010 Triple Threads Football is a really, really good product that falls a few shortcomings shy of being great. Per usual, the card themes are excellent and the checklist is extremely intriguing. The one issue I always have with Triple Threads Football is that it always feels like a poor man's version of it's baseball counterpart. The Triple Threads formula lends itself to baseball far better, at the same time the gap between the two isn't as great as it has been in year's past. Each $150-$180 box delivers two packs (mini-boxes), a pair of triple relics and 10 numbered base cards. 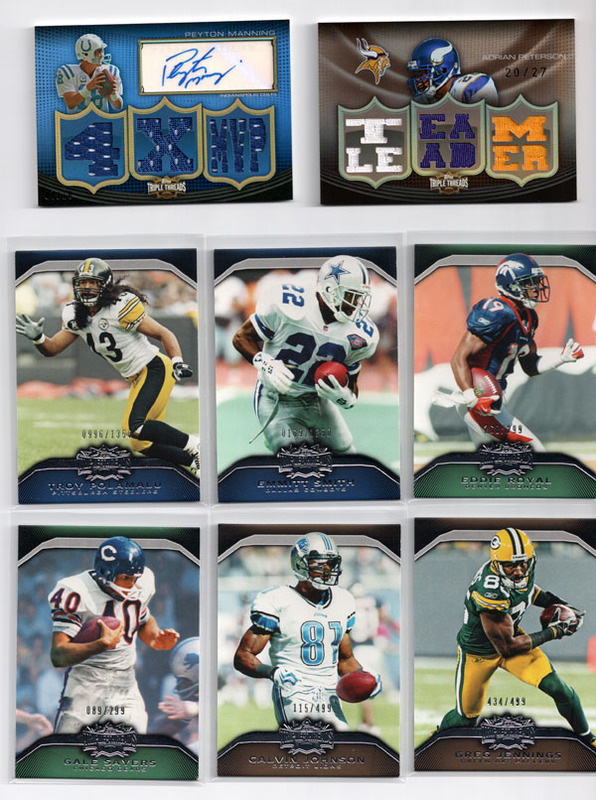 If you've enjoyed Triple Threads Football in the past, there's no reason you shouldn't enjoy the 2010 version. To those who have never bought a box before, I would say that collectors of past legends and current stars would enjoy the product far more than 2010 rookie class collectors. 2010 TOPPS TRIPLE THREADS FOOTBALL HOBBY BOX FACTORY SEALED NEW TIM TEBOW RC?